Mooon! is a battery LED lamp by Fermob conceived by the designer Tristan Lohner. Thanks to a rechargeable battery, no direct power connection is necessary and the device can be set up wherever light is needed. With a battery life of up to 6 hours, the lamp is a practical appliance in the garden for barbecues, on camping holidays, or just about anywhere in the house. With a 2 m long USB cable, the lamp is easily recharged in 5 hours. Thanks to the adjustable light temperature function, the light intensity can be changed according to the mood and function. In addition, two light temperatures are available to choose from: cool white (6000 K) or warm white (4000 K). 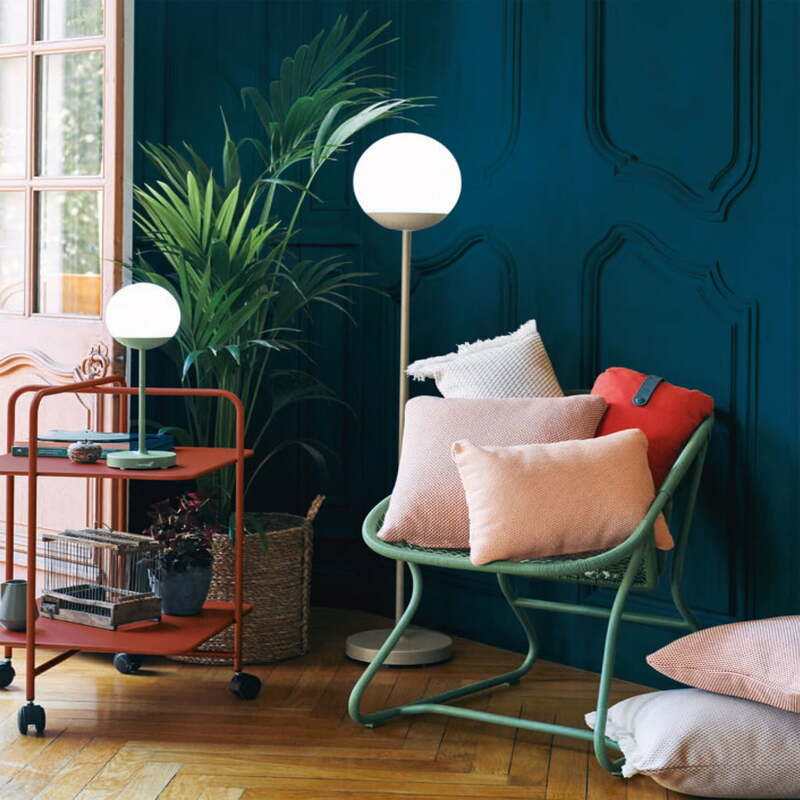 This makes it possible to create a bright setting to work in or a cosy atmosphere to relax. Mooon! is also convincing in terms of design. It is not without reason that this name was chosen since the light and stylish expression of the round diffuser is reminiscent of a full moon. A simple aluminium base completes the minimalist design. Thanks to a rechargeable battery, no direct power connection is necessary and the light can be set up wherever light is needed. Battery LED lamp H 40 can comfortably be set up wherever light is needed. Mooon! has a battery life of 6 hours. 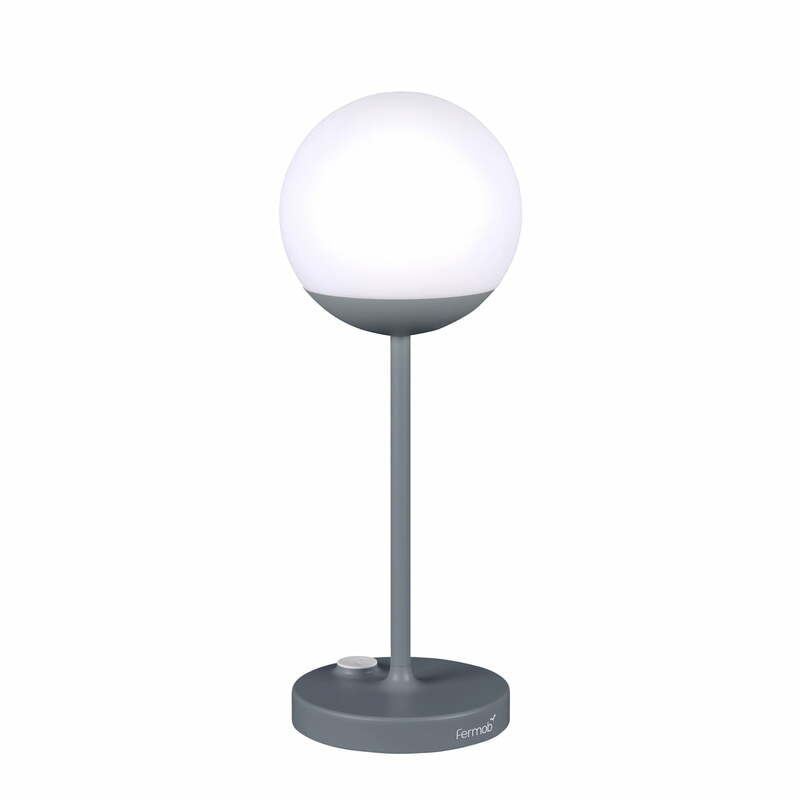 Battery LED light H 40 cm by Fermob in storm grey is a practical appliance in the garden for barbecues, on camping holidays or just anywhere in the house.